SalePoint’s Corporate Headquarters in Columbus, Ohio. SalePoint is a leading provider of high value business solutions to the retail point of sale, corporate retail, higher education, healthcare, and public sector industries. SalePoint’s staff is experienced in implementing self-service kiosks, mobile check-in, eForms, cashiering, point of sale, and corporate applications. The company provides a complete solution ranging from hardware and software to services required to define, implement and fully support the installed solutions. The company’s customers include such leading names as Spencer Gifts, Kaiser Permanente, Cato Corporation, Children’s Specialized Hospital, the University of Chicago and Puerto Rico Aqueduct and Sewer Authority. 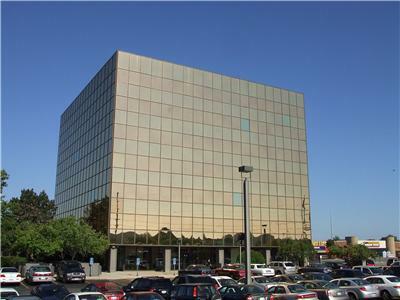 SalePoint is headquartered in Columbus, Ohio with branch operations in Sacramento and San Diego, California, Austin, Texas and Cary, North Carolina. The PatientWorks subsidiary serves the healthcare market. Visit PatientWorks website at www.patientworks.com. Haworth has a Bachelor of Industrial Engineering from Kettering University and Masters in Industrial Administration from Purdue University. He joined SalePoint in 1990 and purchased the company in 1992. Haworth has been the CEO since that time. He worked at General Motors during college. Upon graduation, he joined KPMG, a Big 6 Accounting Firm. Haworth moved to an internal consulting position in the National Field Operating Department at Sears’ headquarters. He was hired by Wickes Corporation, an $8 billion conglomerate and held positions of Financial Analyst, Director of Acquisitions & Divestitures, Division VP Operations, Division General Manager and Assistant Treasurer of the corporation. Haworth was President of Wind Power Systems and General Manager of Metrocast. He previously taught finance and management evening classes at San Diego State University. Streicher has over 20 years of retail experience. He was responsible for implementation and support of Point of Sale and Merchandise Information Systems for a department store chain headquartered in Northern California and before that held retail information technology management positions for the same company. Formerly, he was an Account Manager for NCR Corporation. Paul joined our company in 1991 as a Project Manager, and held other positions as Development Manager and Vice President, General Manager of Corporate Retail Solutions before his current role. Paul oversees Sales, Development and Support for SalePoint’s retail business. Paul holds a Bachelor of Science in Business Marketing from California State University Sacramento and an MBA in Business Management from Golden Gate University. Kauffman joined SalePoint in 2001. Ken oversees the software development activities of the company. He was previously Director of Software Development at Aradiant Corporation, Technical Director at National Dispatch Center, and a Software Engineer at Metrocast. Ken has a BS in Electrical Engineering from San Diego State University and has completed the course work for a Masters in Computer Science from San Diego State University. Snidow manages the sales and marketing activities of PatientWorks. He joined PatientWorks in April of 2003 as the North East Regional Sales Manager. In 2007, he was promoted to National Sales Manager and in January 2013, took on the position of Vice President of Sales PatientWorks. With over 11 years in healthcare sales, Norman understands the unique challenges that face the healthcare industry. Prior to PatientWorks Norman was the eBusiness Regional Account Manager for Moore North America where he managed eight sales offices and over forty sales professionals in marketing a new category of technology based solutions. Norman has a Bachelor of Arts degree in Economics and Business from Randolph-Macon College and works from our sales office in Richmond, Virginia. Shaw joined SalePoint in 1997 as a staff accountant and has been promoted through various accounting responsibilities in the company to her current position as Vice President and Controller. Shaw was previously employed with LuPaul Industries in Jackson, MI where she directed the company’s accounting and human resources operations. She holds a Bachelor of Arts degree in Business Management Finance from Capital University, Columbus Ohio. Fortes has been a member of the SalePoint team since 1995. She has held positions of Implementation Manager, Project Manager, and Client Services Manager for our host products. Prior to joining SalePoint, Cindy spent over 10 years with Weinstock’s Department Stores working in the stores as an Area Manager and in the corporate office as a Buyer for the children’s and women’s departments. Cindy’s current responsibilities include managing the support department for our Retail Interact product. Cindy holds a Bachelor of Arts degree from San Francisco State University. Sam has been with SalePoint since 1990 and has served the company in numerous roles. He had led major projects with key healthcare, higher education, and public sector customers. In addition, he is the account manager for many of the company’s customers. Amir came to SalePoint as a software engineer with a computer sciences degree from UCLA. After years of programming for the company, Amir transitioned to a role leading project management and implementations. His responsibilities include projects for both SalePoint and PatientWorks. Winters manages the accounting and financial functions of PatientWorks and is located in the Cary North Carolina office. She has a BS in Business Administration/Computer and Information Sciences degree from the University of Florida and a AAS in Accounting from Wake Technical Community College. Prior to PatientWorks she was a Senior Financial Accountant at Bassett & Associates, P.A. in Raleigh, NC. She held a Computer Programmer position at IBM for ten years. SalePoint is a leading provider of high value business solutions to the retail, healthcare, higher education and public sector industries. The company was founded in 1987 and since then has provided technology solutions to some of the leading names in each of these industries. The company has grown through acquisitions as well as product development. In 1992, Larry Haworth, the current CEO, acquired the company from its founder. In 1996, the company acquired the retail systems companies of MicroBilt, a First Data company. In 2012, the company acquired the PatientWorks division of Newbold Corporation which provides software solutions to the healthcare market. SalePoint delivers solutions that enable retailers to drive sales, reduce costs, and maximize the bottom line. We give retailers the ability to optimize inventory and buying processes through planning and open to buy, to increase sales with e-commerce and customer loyalty programs, to reduce cost by seamlessly integrating a robust and efficient Point of Sale application to speed the customer quickly and accurately through the check out, and to meet the ever changing demands of payment industry compliance requirements. SalePoint offers Revenue Cycle automation solutions for healthcare providers. Through implementation of advanced technology at the front end of their Revenue Cycle they can increase revenues, reduce AR, reduce bad debts, lower operating costs, streamline their processes and make their patients happy. The KioskWorks solution is built on PatientWorks electronic document foundation and has features and functionality that easily differentiate it from the competition. SalePoint provides enhanced cashiering solutions integrated in real time to college and universities student information systems. Our enhanced cashiering solution reduces registration lines, is simple and easy to use, integrates with credit/debit card payment processors, is PA DSS validated for PCI Compliance, posts payments in real time, and eliminates duplicate work. SalePoint provides point of sale and cashiering solutions for the public sector that improve cash management, reduce costs, increase the speed of processing, improve customer service, enhance the audit and control of funds, facilitate quick and accurate close out and balancing, and integrate in real time to the enterprise billing and financial systems. The solution has been deployed in utilities, government agencies and insurance companies. The expansion of the company products in the healthcare industry with the acquisition of PatientWorks has fueled growth and expansion of the customer base in the healthcare industry. Additionally the company has partnered with companies such as Etelu to offer additional solutions to healthcare providers.